The contribution of the lymphatics to the absorption and systemic availability of recombinant human epoetin alfa (rHuEPO) following s.c. injection was examined using a cannulated sheep model. Parallel studies were conducted in sheep where a single bolus dose was administered either by i.v. (10, 100, or 1000 IU/kg) or s.c. (400 IU/kg) injection. The first s.c. group served as a control for the calculation of absolute bioavailability. In the second group, the efferent popliteal lymphatic duct was cannulated and peripheral lymph draining the injection site was continuously collected. In the third group, the thoracic duct was cannulated to allow collection of central lymph just prior to entry into the systemic circulation. Blood was periodically sampled from all animals, and concentrations in serum and lymph were determined by enzyme-linked immunosorbent assay. The cumulative amount of rHuEPO recovered in peripheral and central lymph was 83.9 ± 6.6% and 75.3 ± 3.9% of the administered dose, respectively, indicating almost complete absorption from the s.c. injection site and minimal clearance during transit through the lymphatic system. After i.v. administration, the systemic clearance of rHuEPO decreased with increasing dose, reflecting capacity-limited elimination kinetics. A pharmacokinetic model was developed to simultaneously fit experimental data for all treatment groups and estimate bioavailability. The direct measurement of >75% of the dose in peripheral and central lymph independently verifies the calculated bioavailability of 87% and demonstrates the major role of the lymphatic route in the overall s.c. bioavailability of rHuEPO after s.c. administration with this animal model. Erythropoietin (EPO) is a renally synthesized 30.4-kDa glycoprotein involved in the regulation of red blood cell proliferation and differentiation. Recombinant human epoetin alfa (rHuEPO) has been extensively utilized in the treatment of anemia associated with chronic renal failure, AIDS, and chemotherapy. Pharmacokinetic studies of rHuEPO have demonstrated dose-dependent disposition in humans (Flaharty et al., 1990; Veng-Pedersen et al., 1995), monkeys (Ramakrishnan et al., 2003), sheep (Veng-Pedersen et al., 1999), and rats (Kato et al., 1997) after i.v. administration. In these studies, nonlinear kinetics were characterized by decreased clearance with increasing dose. Although the exact elimination pathway has not been fully elucidated, studies comparing clearance (CL), mean residence time (MRT), and terminal half-life (t1/2) pre- and postablation of the bone marrow in sheep, have provided significant evidence that elimination occurs predominantly in the bone marrow (Chapel et al., 2001). The capacity-limited CL is likely to be a receptor-mediated endocytosis by erythroid progenitor cells and has been described previously using a Michaelis-Menten-type elimination (Kato et al., 1997; Veng-Pedersen et al., 1999; Ramakrishnan et al., 2003). Although EPO receptors appear to have an important role in the distribution of EPO outside the central compartment (Chapel et al., 2001), dose-related changes in volume of distribution at steady state (Vss) have not been observed in rats (Kato et al., 1997) suggestive of a nonsaturable distribution process (Veng-Pedersen et al., 1999). Absorption of rHuEPO after s.c. injection is slow and prolonged with the time to maximal concentration (Tmax) occurring between 10 and 18 h in humans (Kampf et al., 1989; Jensen et al., 1994). Reported bioavailability estimates are low and variable, ranging from 18 to 49%; however, these original noncompartmental bioavailability assessments have not taken into account the effects of nonlinear clearance (Boelaert et al., 1989; Kampf et al., 1989; Salmonson et al., 1990; Halstenson et al., 1991). The large molecular size of rHuEPO has been suggested to impede absorption from the s.c. injection site (Macdougall et al., 1991) based on the negative correlation previously observed between the molecular size and bioavailability of heparins (Emanuele and Fareed, 1987). Despite the apparent low bioavailability, s.c. administration of rHuEPO produces equivalent efficacy to i.v. administration, and this is assumed to be due to the prolonged absorption leading to reduced receptor saturation (Kampf et al., 1989; Bommer et al., 1991). Absorption rates of rHuEPO vary according to the administration site, most likely reflecting regional differences in blood and lymph flow (Jensen et al., 1994). The lymphatics are thought to be the primary route of absorption from the s.c. injection site for protein therapeutics greater than about 16 kDa due to restricted vascular access afforded by the continuous endothelial layer of blood capillaries (Supersaxo et al., 1990; Porter and Charman, 2000; McLennan et al., 2003). The intercellular junctions within the lymphatic vessel wall create cleft-like openings that provide an alternative pathway from the interstitium into the lymph and indirectly into the systemic circulation via the thoracic duct (Leak, 1976). The relative roles of the blood and lymphatic absorption pathways after s.c. administration has been directly assessed using lymph cannulated animal models for a number of therapeutic proteins including interferon α-2a (Supersaxo et al., 1990), human growth hormone (Charman et al., 2000), insulin (Charman et al., 2001), and rmetHu-Leptin (McLennan et al., 2003). Collectively, the importance of the lymphatics in the absorption and systemic availability of proteins has been demonstrated by the recovery of a high proportion of the administered protein dose (17-62%) in peripheral lymph draining the s.c. injection site. Absorption of rHuEPO into lymph has been previously measured in a thoracic duct cannulated rat model, although because lymph was sampled at discrete intervals as opposed to continuous collection, the extent of rHuEPO absorption via the lymphatics could not be quantified (Moriya et al., 1997). The lymphatics have also been implicated as a significant absorption pathway by pharmacokinetic modeling of serum concentrations in monkeys, which identified a slow absorption process for approximately 65% of the absorbed dose that was attributed to lymphatic uptake (Ramakrishnan et al., 2003). The objective of this study was to quantify the contribution of the lymphatics to the absorption and systemic availability of rHuEPO following s.c. injection. The nonlinearity of rHuEPO after i.v. administration in sheep was assessed at different dose levels, and a compartmental model was developed to estimate bioavailability. Given the low reported bioavailability of rHuEPO in the literature, an additional aim was to investigate the potential for clearance during transport through the lymphatics contributing to a reduction in bioavailability. Materials. rHuEPO solution (20,000 U/ml) was provided by Amgen Inc. (Thousand Oaks, CA). Commercial Quantikine In Vitro Diagnostic human erythropoietin enzyme-linked immunosorbent assay kits were purchased from R&D Systems (Minneapolis, MN) for sample analysis. Horse serum was purchased from Invitrogen (Carlsbad, CA). Intravenous 16-gauge catheters (133 mm, Angiocath; BD Biosciences, San Jose, CA) were used to facilitate blood sampling. Sterilized medical grade polyvinyl cannulae of 0.58-mm internal diameter and 0.96-mm external diameter (W.F. Scientific, Victoria, Australia) were used for lymphatic duct cannulations. Blood samples were collected into 5-ml glass serum collection tubes (Vacutainer; BD Biosciences). Peripheral lymph was collected into 10-ml glass collection tubes containing no anticoagulant (Vacutainer; BD Biosciences), and central lymph was collected into 120-ml polypropylene tubes (Sarstedt Australia, Ingle Farm, Australia). Study Design. The animal studies were approved by The University of Melbourne Animal Experimentation Ethics Committee and were conducted in accordance with the National Institute of Health Guidelines for the Care and Use of Laboratory Animals. Adult male merino sheep weighing between 40 and 60 kg were supplied by the Victorian Institute of Animal Science (Werribee, Australia). A parallel study design was adopted utilizing four treatment groups. A single dose of rHuEPO was administered either by i.v. or s.c. injection to animals in all four treatment groups. The first treatment group served as an i.v. control group in which an i.v. bolus injection (10, 100, or 1000 IU/kg) was administered via venipuncture into the jugular vein. A range of i.v. doses was included to assist in defining the expected nonlinear kinetics of rHuEPO. The three s.c. administration groups included a nonlymph cannulated s.c. control and peripheral lymph cannulated and central lymph cannulated experimental groups. Doses (s.c.) were administered as a bolus injection using a 23-gauge needle into the interdigital space of the hind leg (cannulated leg for peripheral lymph cannulated animals). Doses were administered according to Table 1. Animals were housed in metabolism cages during the experimental period, and food and water were available ad libitum. Surgical Procedures. Catheters (i.v.) were inserted into the jugular vein of all sheep to allow blood sampling. The efferent duct of the popliteal lymph node was cannulated in the peripheral lymph cannulated group as previously described (Porter et al., 2001). Peripheral lymph cannulation enabled continuous and quantitative collection of peripheral lymph draining the s.c. injection site allowing direct assessment of lymphatic absorption processes. Animals were allowed to recover for a period of approximately 36 h following surgery prior to dosing so that animals regained normal movement in the lymph cannulated leg. A consistent flow rate of greater than 3 ml/h was required for peripheral lymph cannulated animals to be included in the study based on previous experience with the sheep model. The thoracic duct was cannulated in the central lymph cannulated group as previously described (Porter et al., 2001). Central lymph cannulation enabled the collection of central lymph just prior to emptying into the systemic circulation allowing the direct assessment of lymphatic transport processes. After thoracic lymph surgery, animals were transferred to metabolism cages and were allowed to recover for a period of approximately 16 h prior to dosing. A reduced recovery period following surgery was adopted for the central lymph cannulated animals due to central lymph flow being less dependent on animal movement than peripheral lymph flow (and also because the lack of surgery in the leg in the central group led to more rapid return to normal movement) and also to minimize fluid loss during the recovery period. A consistent flow rate of greater than 30 ml/h was required for central lymph cannulated animals to be included in the study based on previous experience with the sheep model. Sample Collection. For the 10 IU/kg i.v. control group (n = 2), blood samples were withdrawn immediately prior to dosing and at 1, 3, 6, 10, 15, and 30 min and 1, 2, 3, 4, 5, 6, 7, 8, 9, 10, 11, 12, 14, 16, 18, and 24 h postdosing. For the 100 and 1000 IU/kg i.v. control groups (n = 4 for each), blood samples were withdrawn prior to dosing and at 1, 3, 6, 10, 15, and 30 min and 1, 2, 4, 6, 8, 10, 12, 18, 24, and 30 h postdosing. Additional blood samples were withdrawn at 48, 54, 72, 80, and 96 h postdosing for the 1000 IU/kg i.v. control group. For the s.c. control (n = 5) and peripheral lymph-cannulated (n = 4) groups, blood samples were withdrawn prior to dosing and 0.5, 1, 4, 8, 12, 18, 24, 30, 48, and 60 h postdosing. For the central lymph cannulated group (n = 4), a limited sampling schedule was required, and blood samples were withdrawn prior to dosing 0.5, 1, 4, 8, 12, 18, and 24 h postdosing. All blood samples were withdrawn via the in-dwelling i.v. catheter inserted in the jugular vein. One milliliter of blood was initially withdrawn and discarded to flush the catheter and to ensure collection of circulating blood. Five milliliters of blood was subsequently withdrawn and transferred into serum collection tubes. The jugular vein catheter was flushed immediately following blood withdrawal with heparinized saline (10 IU/ml) to ensure patency. Blood samples were allowed to clot for 60 min at ambient temperature prior to centrifugation at 2576g for 10 min. Serum aliquots were taken and frozen at -80°C until analysis. Peripheral lymph samples were continuously collected at hourly intervals for the first 12 h and then at 6-h intervals to 36 h postdosing. Central lymph samples were continuously collected at hourly intervals for the first 12 h and then at 1- to 2-h intervals to 24 h postdosing. Lymph samples were allowed to clot for 60 min at ambient temperature prior to centrifugation at 2576g for 10 min. Aliquots of the supernatant were taken and frozen at -80°C until analysis. Assay Methodology. The rHuEPO concentrations in serum and lymph samples were determined using a commercial human erythropoietin sandwich enzyme-linked immunosorbent assay kit. All the reagents from the kit were used according to the prescribed instructions. Reference standards and three quality controls (QCs) were prepared using rHuEPO solution provided by Amgen Inc. Calibration curves consisted of seven standards and provided an analytical range of 8.16 to 317 mIU/ml. QCs were prepared at three concentrations (12.9, 77.4, and 232 mIU/ml) and included in all assays to monitor sample stability and assay performance. For the analysis of serum samples, standards and serum sample dilutions were prepared using pooled sheep serum. For the analysis of peripheral or central lymph samples, standards and sample dilutions were prepared using horse serum due to the availability of commercial supplies and the larger dilution factors required (typically 50-5000-fold). Where horse serum was used for sample dilution, a minimum dilution factor of 1:10 was adopted to minimize matrix interference, and all QCs prepared in peripheral or central lymph were diluted 1:10 with horse serum prior to assaying to reflect sample preparation. Intra-assay precision and accuracy were determined by analysis of QCs in replicates of five across the calibration range. The precision of the assay was <10%, and the accuracy of measured QC concentrations was consistently within ±15% of the nominal concentration. Endogenous EPO was not quantifiable in the blank sheep or horse serum used for sample dilution, suggesting minimal crossreactivity of endogenous substances with the assay. Similarly, endogenous EPO was undetectable in predose serum and lymph samples from all animals. Noncompartmental Pharmacokinetic Analysis. Noncompartmental analysis was performed using WinNonlin (version 3.2; Pharsight, Mountain View, CA) for individual serum profiles. The terminal elimination half-life (t1/2), area under the serum concentration-time curve extrapolated to infinity [AUC(0-∞)], Vss, serum CL, and MRT were calculated using standard pharmacokinetic approaches for the i.v. treatment groups (Gibaldi and Perrier, 1982). For the s.c. treatment groups, the peak serum concentrations (Cmax) and Tmax were taken directly from experimental data, and terminal t1/2 was calculated using a standard pharmacokinetic approach. In the peripheral and central lymph groups, the mass of rHuEPO collected in each lymph sampling interval was calculated by the product of the measured concentration and the volume of lymph. The lymph recovery was calculated as a percentage of the administered dose. Proposed pharmacokinetic model for rHuEPO administered by i.v. or s.c. bolus injection. For the i.v. treatment groups, the blood and lymph absorption pathways are not relevant. For the nonlymph cannulated s.c. group, rHuEPO was absorbed via the blood pathway (kblood) or via the peripheral and central lymph (klymph) into the systemic circulation (kinput). For the peripheral lymph cannulated group, the proportion of the dose draining the s.c. injection site was quantitatively collected prior to transferal into central lymph. For the central lymph cannulated group, the proportion of the dose absorbed via the peripheral lymph to the central lymph was quantitatively collected prior to emptying into the systemic circulation. The rate process described by kinput is not relevant for the lymph cannulated groups due to quantitative lymph collection. The goodness-of-fit for the models was assessed by the absence of systematic deviations in the weighted residuals (the residual being the difference between the predicted values and experimental datum), and the precision of parameter estimates was demonstrated by the coefficient of variation. Noncompartmental Pharmacokinetic Analysis. The mean serum concentration-time profiles following i.v. administration at three dosing levels (10, 100, and 1000 IU/kg) are shown in Fig. 2. The increase in AUC(0-∞) was not proportional to dose indicative of nonlinearity (Table 2). The CL decreased with increasing dose, which is consistent with the kinetics observed in other species that also demonstrate capacity-limited elimination (Flaharty et al., 1990; Veng-Pedersen et al., 1995, 1999; Kato et al., 1997). The Vss was broadly consistent across the three i.v. dosing levels, although it should be recognized that the reliability of these estimates may be affected by the observed nonlinear clearance (Cheng and Jusko, 1988). 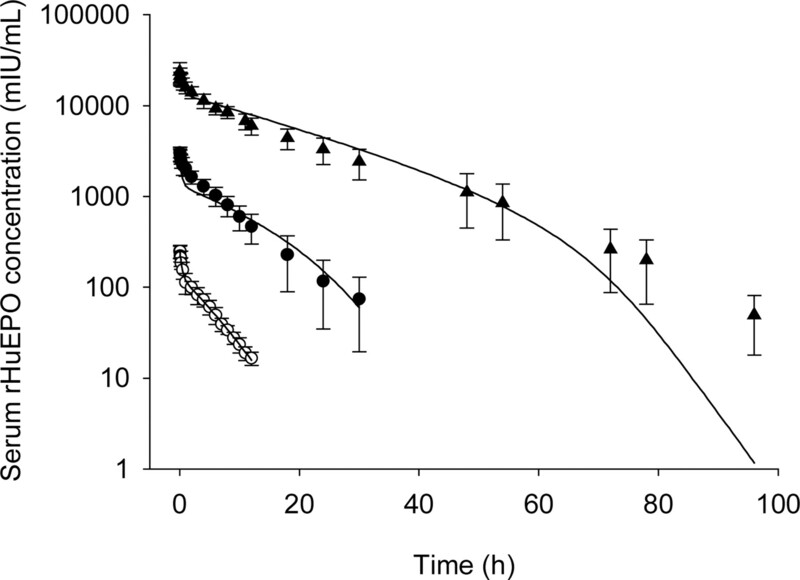 Serum rHuEPO concentration versus time profiles following i.v. administration of 10 (open circle), 100 (filled circle), and 1000 (filled triangle) IU/kg to the i.v. treatment groups (n = 2-4, mean ± S.D.). Symbols, experimental data; solid lines, model-predicted fits for the mean observed data. The mean serum concentration-time profiles for the s.c. treatment groups are shown in Fig. 3. Prolonged absorption was evident after s.c. injection with Tmax occurring at approximately 8 h for the s.c. control group and slightly earlier for the lymph cannulated groups (Table 3). rHuEPO was absorbed more rapidly in sheep (Tmax, 4-12 h) compared with humans (Tmax, 10-18 h; Kampf et al., 1989; Jensen et al., 1994). The terminal t1/2 for the s.c. control group was 10.1 ± 1.6 h, which was longer than the terminal t1/2 observed after i.v. administration to the 10 and 100 IU/kg i.v. control groups. Serum rHuEPO concentration versus time profiles (A), cumulative recovery of rHuEPO in lymph versus time profiles (B), and lymph rHuEPO concentrations (C) following s.c. administration of 400 IU/kg to the nonlymph cannulated s.c. control (filled triangle, A only), s.c. peripheral lymph cannulated (filled circle), and s.c. central lymph cannulated (open circle) groups (mean ± S.D., n = 4-5). Symbols, experimental data; solid lines, model-predicted fits for the mean observed data. 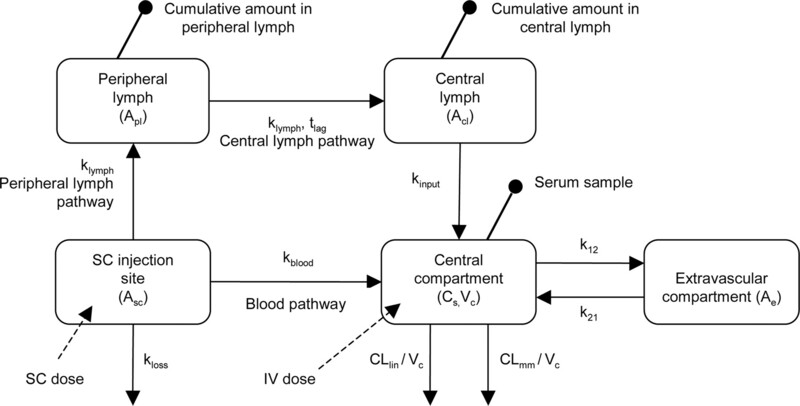 The peripheral lymph flow rate (filled triangle) and central lymph flow rate (open triangle) expressed in milliliters per hour are shown in C.
Collection of peripheral and central lymph in the lymph cannulated groups resulted in significant reductions in the serum concentrations as evidenced by reductions in Cmax and AUC(0-t) (Table 3). Low serum concentrations in the lymph cannulated groups precluded determination of a terminal t1/2 and calculation of AUC(0-∞). The reduced systemic availability in the lymph cannulated groups can be attributed to absorption into the lymphatics. In the peripheral lymph cannulated group, 83.9 ± 6.6% of the administered dose was recovered in the peripheral lymph draining the s.c. injection site. In the central lymph cannulated group, 75.3 ± 3.9% of the dose was recovered in the central lymph just prior to emptying into the systemic circulation. The recoveries in the peripheral and central lymph were not statistically different suggesting that there was minimal loss of rHuEPO during transit through the lymphatics. The mean serum concentrations for the central lymph cannulated group were marginally higher than mean serum concentrations for the peripheral lymph cannulated group, although this difference was probably attributed to animal variability rather than redistribution from the lymphatics. Compartmental Modeling. The pharmacokinetic model-predicted fits to simultaneously describe the disposition of rHuEPO after i.v. administration at three dosing levels (10, 100, and 1000 IU/kg) and after s.c. administration to s.c. controls, and lymph cannulated groups are shown in Figs. 2 and 3, respectively. Parameter estimates are shown in Table 4, and the precision of all estimates appears reasonable as evidenced by the low coefficient of variation. The general pharmacokinetic model provided a suitable fit for the 10 and 100 IU/kg i.v. control groups, although serum concentrations were overestimated for the 1000 IU/kg i.v. control group in the terminal portion of the serum concentration-time profiles. Although attempts were made to improve the compartmental fits using other model variations (such as a single linear elimination pathway versus a single Michaelis-Menten elimination pathway), the resulting fits deviated more than those that are shown. The model predicted Vc (39.8 ml/kg) was equivalent to the plasma volume in sheep (Adams and McKinley, 1995) and was consistent with the extent of distribution in other animal species (Flaharty et al., 1990). The model-predicted fits for the mean serum concentrations for the s.c. treatment groups and cumulative recovery in lymph for the peripheral and central lymph cannulated groups are shown in Fig. 3, A and B, respectively. Peripheral and central lymph concentration-time profiles and lymph flow rates are also shown in Fig. 3C. The lymph concentration-time profiles show significantly higher concentrations in the peripheral lymph when compared with the central lymph reflecting the higher dilution factor imparted by the greater central lymph volume. A parallel decline in lymph concentrations indicated similar kinetic parameters for the absorption into peripheral and central lymph. tlag was required to describe the recovery of rHuEPO in the central lymph absorption model (Table 4). The compartmental model estimate for the total fraction of the dose absorbed (Fabs) was 0.87, which was in reasonable agreement with the directly measured recovery of 75.3% in central lymph just prior to entry into the systemic circulation. The fraction of the absorbed dose taken up via the lymph pathway (Flymph) was 0.96, which demonstrated that rHuEPO was almost entirely absorbed into the systemic circulation via the lymphatics in sheep. The low serum concentrations were the most probable cause of the deviations between the observed serum concentrations and the model predicted fits. The general pharmacokinetic model closely predicted the serum concentrations for the s.c. control group and provided an estimate for transfer rate constant from lymph into blood (kinput) of 1.79 h-1. Nonlinear disposition of rHuEPO was observed in sheep following i.v. administration at three dosing levels (10, 100, and 1000 IU/kg). A dose-dependent decrease in CL of rHuEPO was observed in sheep with corresponding dose-dependent increases in AUC(0 - ∞) and MRT. The Vss was broadly comparable across the three dosing levels and suggested that nonlinearity resulted primarily from saturable elimination processes rather than saturable distribution (Kato et al., 1997). The nonlinear pharmacokinetic behavior of rHuEPO in sheep was consistent with trends observed in humans and rats (Flaharty et al., 1990; Veng-Pedersen et al., 1995; Kato et al., 1997; Ramakrishnan et al., 2004). In line with previous studies that have used a single saturable Michaelis-Menten elimination pathway to model the nonlinear disposition of rHuEPO (Veng-Pedersen et al., 1995, 1999; Ramakrishnan et al., 2003, 2004), a two-compartment disposition model with elimination via parallel nonlinear Michaelis-Menten and linear pathways best described the biexponential decline in serum concentrations and nonlinear disposition for the i.v. control treatment group despite some bias in the model predicted fits at the 1000 IU/kg dose. The ratio of nonlinear (saturable receptor-mediated endocytosis) and linear (renal or other) clearance mechanisms appears to vary between species (Kato et al., 1997), making comparisons between studies difficult. A two-compartment disposition model with first order absorption via blood and lymph pathways and dual parallel linear and nonlinear elimination pathways was used to model serum concentrations after s.c. administration and to estimate the total fraction of the dose absorbed into the systemic circulation (Fabs). The compartmental estimate for Fabs in sheep was 87%, which was significantly higher than previous literature estimates of less than 50% in other species (Boelaert et al., 1989; Kampf et al., 1989; Salmonson et al., 1990; Halstenson et al., 1991). Previous noncompartmental estimations of bioavailability have not taken into account the nonlinear disposition kinetics of rHuEPO and have estimated bioavailability relative to a single i.v. dose administration. More recently, s.c. bioavailability of between 27 and 100% was estimated in humans (Ramakrishnan et al., 2004) and monkeys (Ramakrishnan et al., 2003) using compartmental methods over a wide range of s.c. doses (300-40,000 IU/kg). The estimated Fabs in sheep at a dose of 400 IU/kg was higher (87%) than in humans at a comparable dose (approximately 50%) and in monkeys (27%); however, the disparity may reflect, in part, differences in the site of administration, species, and modeling approaches. Following s.c. administration, rHuEPO was preferentially absorbed via the lymphatics as demonstrated by the recovery of 83.9 ± 6.6% of the administered dose in the peripheral lymph. The compartmental Flymph estimate of 0.96 also emphasizes the predominant absorption of rHuEPO via the lymphatics following s.c. administration to sheep. The tlag required to describe cumulative recovery in central lymph (0.52 h) most likely reflects transit from the injection site to the point of lymph collection. Similar total lymph recoveries in the peripheral and central lymph cannulated groups, together with similar serum concentrations, demonstrated mass balance of the administered rHuEPO dose and suggested that rHuEPO does not undergo significant clearance within the lymphatics or degradation at the s.c. injection site in sheep. Furthermore, the high recovery of the rHuEPO dose in the central lymph (75.3 ± 3.9%) in this study also supports and independently verifies the compartmental Fabs estimate of 0.87. The direct measurement of rHuEPO recovery in peripheral lymph together with the model-estimated Fblood (0.04) suggested that less than 5% of the total fraction absorbed was absorbed directly into the blood. The contribution of direct vascular absorption in lymph cannulated sheep was substantially lower than the 35% previously predicted in monkeys based on serum disposition (Ramakrishnan et al., 2003). A 10-h delay in absorption via a first order linear pathway (which was assumed to be via the lymphatics) was previously observed in monkeys; however, no lag time was required to model the cumulative recovery in peripheral lymph in the current studies. A short lag time of approximately 0.52 h was necessary to successfully describe cumulative recovery in central lymph in sheep. The majority of rHuEPO (>90%) was absorbed into peripheral and central lymph within the first 12 h following s.c. administration. The results from this study further reinforce the importance of the lymphatics for the absorption and bioavailability of therapeutic proteins. The absorption of rHuEPO (30.4 kDa) was found to be occur almost completely via the lymphatics with minimal recovery in blood in animals in which lymph was continuously collected (i.e., for animals in which lymph was prevented from emptying into the systemic circulation). The molecular size of rHuEPO did not appear to impede absorption from the s.c. injection site. Based on these results and the previously described molecular weight dependence of lymphatic uptake (Supersaxo et al., 1990; Charman et al., 2000; McLennan et al., 2003), it is likely that for therapeutic proteins larger in size than rHuEPO, such as monoclonal antibodies the lymphatics will provide the predominant absorption pathway due to restricted vascular access. It is presently not known whether a maximum molecular weight exists above which absorption is reduced due to restricted transport through the interstitium. Notwithstanding the clear trends observed in the current (and previous) studies, it is acknowledged that the interdigital injection site utilized in sheep may not be representative of the common administration sites in humans (abdomen, thigh, and upper arm). This administration site was necessary in the current studies since it is the only site at which quantitative collection of the peripheral lymph directly draining the s.c. administration site is technically feasible. Future studies will investigate the influence of the administration site on the fraction of the dose absorbed via the lymphatics and the overall systemic availability. Further characterization of the absorption processes of s.c. administered dose forms is imperative for the determination of more appropriate pharmacokinetic/pharmacodynamic models and also in appreciating the potential toxicological effects of presystemic lymphatic exposure. We thank Majella Snelling for technical assistance. This work was supported by Amgen Inc.
ABBREVIATIONS: EPO, erythropoietin; rHuEPO, recombinant human epoetin alfa; CL, clearance; MRT, mean residence time; Vss, volume of distribution at steady state; QC, quality control; AUC(0-∞), area under the serum concentration-time curve extrapolated to infinity; tlag, lag time; kloss, degradation or loss from the s.c. injection site; Fabs, total fraction of the dose absorbed. ↵1 Current Address: Department of Clinical Pharmacology, Sandwich Laboratories, Pfizer Ltd., Sandwich, Kent, United Kingdom. Adams D and McKinley M (1995) The sheep, in ANZCCART-News, vol 8, pp 1-4, Australian and New Zealand Council for the Care of Animals in Research and Teaching, Glen Osmond, South Australia. Boelaert JR, Schurgers ML, Matthys EG, Belpaire FM, Daneels RF, De Cre MJ, and Bogaert MG (1989) Comparative pharmacokinetics of recombinant erythropoietin administered by the intravenous, subcutaneous and intraperitoneal routes in continuous ambulatory peritoneal dialysis (CAPD) patients. Perit Dial Int 9: 95-98. Bommer J, Barth HP, Zeier M, Mandelbaum A, Bommer G, Ritz E, Reichel H, and Novack R (1991) Efficacy comparison of intravenous and subcutaneous recombinant human erythropoietin administration in hemodialysis patients. Contrib Nephrol 88: 136-143. Chapel S, Veng-Pedersen P, Hohl RJ, Schmidt RL, McGuire EM, and Widness JA (2001) Changes in erythropoietin pharmacokinetics following busulfan-induced bone marrow ablation in sheep: evidence for bone marrow as a major erythropoietin elimination pathway. J Pharmacol Exp Ther 298: 820-824. Charman SA, McLennan DN, Edwards GA, and Porter CJH (2001) Lymphatic absorption is a significant contributor to the subcutaneous bioavailability of insulin in a sheep model. Pharm Res (NY) 18: 1620-1626. Charman SA, Segrave AM, Edwards GA, and Porter CJH (2000) Systemic availability and lymphatic transport of human growth hormone administered by subcutaneous injection. J Pharm Sci 89: 168-177. Cheng HY and Jusko WJ (1988) Mean residence time concepts for pharmacokinetic systems with nonlinear drug elimination described by the Michaelis-Menten equation. Pharm Res (NY) 5: 156-164. Emanuele R and Fareed J (1987) The effect of molecular weight on the bioavailability of heparin. Thromb Res 48: 591-596. Flaharty KK, Caro J, Erslev A, Whalen JJ, Morris EM, Bjornsson TD, and Vlasses PH (1990) Pharmacokinetics and erythropoietic response to human recombinant erythropoietin in healthy men. Clin Pharmacol Ther 47: 557-564. Gibaldi M and Perrier D (1982) Pharmacokinetics. Marcel Dekker, Inc., New York. Halstenson CE, Macres M, Katz SA, Schnieders JR, Watanabe M, Sobota JT, and Abraham PA (1991) Comparative pharmacokinetics and pharmacodynamics of epoetin alfa and epoetin beta. Clin Pharmacol Ther 50: 702-712. Jensen JD, Jensen LW, and Madsen JK (1994) The pharmacokinetics of recombinant human erythropoietin after subcutaneous injection at different sites. Eur J Clin Pharmacol 46: 333-337. Kampf D, Kahl A, Passlick J, Pustelnik A, Eckardt KU, Ehmer B, Jacobs C, Baumelou A, Grabensee B, and Gahl GM (1989) Single-dose kinetics of recombinant human erythropoietin after intravenous, subcutaneous and intraperitoneal administration: preliminary results. Contrib Nephrol 76: 106-110. Kato M, Kamiyama H, Okazaki A, Kumaki K, Kato Y, and Sugiyama Y (1997) Mechanism for the nonlinear pharmacokinetics of erythropoietin in rats. J Pharmacol Exp Ther 283: 520-527. Leak LV (1976) The structure of lymphatic capillaries in lymph formation. Fed Proc 35: 1863-1871. Macdougall IC, Roberts DE, Coles GA, and Williams JD (1991) Clinical pharmacokinetics of epoetin (recombinant human erythropoietin). Clin Pharmacokinet 20: 99-113. McLennan DN, Porter CJ, Edwards GA, Brumm M, Martin SW, and Charman SA (2003) Pharmacokinetic model to describe the lymphatic absorption of r-metHuleptin after subcutaneous injection to sheep. Pharm Res (NY) 20: 1156-1162. Moriya H, Maitani Y, Shimoda N, Takayama K, and Nagai T (1997) Pharmacokinetic and pharmacological profiles of free and liposomal recombinant human erythropoietin after intravenous and subcutaneous administrations in rats. Pharm Res (NY) 14: 1621-1628. Porter CJ and Charman SA (2000) Lymphatic transport of proteins after subcutaneous administration. J Pharm Sci 89: 297-310. Porter CJH, Edwards GA, and Charman SA (2001) Lymphatic transport of proteins after s.c. injection: implications of animal model selection. Adv Drug Deliv Rev 50: 157-171. Ramakrishnan R, Cheung WK, Farrell F, Joffee L, and Jusko WJ (2003) Pharmacokinetic and pharmacodynamic modeling of recombinant human erythropoietin after intravenous and subcutaneous dose administration in cynomolgus monkeys. J Pharmacol Exp Ther 306: 324-331. Ramakrishnan R, Cheung WK, Wacholtz MC, Minton N, and Jusko WJ (2004) Pharmacokinetic and pharmacodynamic modeling of recombinant human erythropoietin after single and multiple doses in healthy volunteers. J Clin Pharmacol 44: 991-1002. Salmonson T, Danielson BG, and Wikstrom B (1990) The pharmacokinetics of recombinant human erythropoietin after intravenous and subcutaneous administration to healthy subjects. Br J Clin Pharmacol 29: 709-713. Supersaxo A, Hein WR, and Steffen H (1990) Effect of molecular weight on the lymphatic absorption of water-soluble compounds following subcutaneous administration. Pharm Res (NY) 7: 167-169. Veng-Pedersen P, Widness JA, Pereira LM, Peters C, Schmidt RL, and Lowe LS (1995) Kinetic evaluation of nonlinear drug elimination by a disposition decomposition analysis: application to the analysis of the nonlinear elimination kinetics of erythropoietin in adult humans. J Pharm Sci 84: 760-767. Veng-Pedersen P, Widness JA, Pereira LM, Schmidt RL, and Lowe LS (1999) A comparison of nonlinear pharmacokinetics of erythropoietin in sheep and humans. Biopharm Drug Dispos 20: 217-223.